Keep your AC well-maintained and you’ll save a ton on cooling costs — and increase its lifespan. Most heating, ventilating and air-conditioning systems (HVAC for short) last about 15 years. Whether you have whole-home AC or a heat pump, you can avoid early replacement and save on air conditioner repair costs. All it takes is a little attention at the beginning of the heating and cooling seasons. In other words, every six months. Many houses have a split system, with the condenser and compressor on the outside of the home and the blower or furnace unit on the inside. No matter what type of HVAC you have, keeping it clean and free of debris is your best bet against wear and tear. Because it’s dangerous to work around electricity, turn off all power to the AC unit every time you need to work on it. Find the shut-off box near the outside unit when you’re cleaning the condenser and compressor, as well as the breaker. Usually found outside the home, the condenser can get clogged with dirt, dust and debris. This reduces its efficiency and could even blow outside allergens into your home. First, remove the fan cage, lifting it off the top of the unit. Use a hose, your hands or a wet-dry vac to remove the debris from the inside, and then reattach the cage. Next, use a hose (not a pressure washer) to clean the fins on the side of the condenser, aiming the stream from the inside out. You can also use a special commercial cleaner. If the fins are crooked, use a straightener tool (available at your local home improvement store) or a dull knife. Use care on this delicate part of the unit. Finally, rake leaves and trim shrubs around the unit itself. The idea is to create optimal airflow to the motor so it doesn’t overheat. The inside part of a split-system air conditioner is what blows cool, dry air into your home. You’ll want to clean it every six months to prevent dust and pollen from building up. First, make sure all power to the unit is shut off. Locate the door to the evaporator coil. It may be lined with cut tape or contain a few bolts or screws, so bring a screwdriver. When you’ve removed the door, give the coils a once-over with a soft brush and follow it up with some foaming, no-rinse coil cleaner. Replace the door. Then, clean out the drain pan that surrounds the blower. Use water mixed with a bit of detergent and some bleach. You can put an antimicrobial tablet in the drain pan to keep mold and algae from growing inside of it. The PVC drainage tube that connects your blower to the outside can get clogged by algae. To make sure the pipe is clear, go to where it drains — this is usually outside, in a utility area or in the garage. Use a shop vac to clean out the end of the tube or flush it for a few seconds with a strong stream from a garden hose. If you live in a humid or dusty area, do this every three months. Change home air filters regularly. This is one of the easiest and most important steps you as a homeowner can do to keep your living space comfortable and your AC running smoothly. 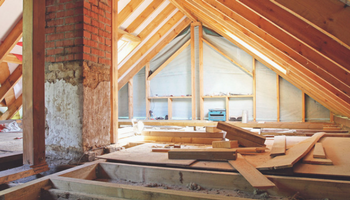 How often will vary according to indoor and outside conditions: dusty parts of the country, construction zones and pollen-prone areas might make it necessary to change them monthly. Finally, check your thermostat’s batteries once a year. If you need new ones, just remove the faceplate, using the release button at the top. Replace the batteries and pop the faceplate back on. It’s that easy! Your batteries may need changing if you see a “low battery” indicator, the screen is blank, or your indoor air temperature isn’t adjusting properly. 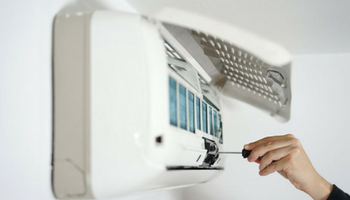 Air conditioner maintenance is not one of those home improvement jobs you can DIY completely. It takes advanced training to recharge refrigerant, adjust and replace fan belts, inspect safeties and controls, and lubricate motors and bearings. If you’re time-starved, a professional AC service company can take care of all your seasonal maintenance tasks. Some offer once- or twice-yearly checkups of all working parts, and the tasks above are included. You can also get free inspections with some home maintenance service contracts. The bottom line: Put as little stress as possible on your AC system. It works hard enough already during the cooling season, and you want it to last as long as possible!